(b) If the supplemental examination certificate states that a substantial new question of patentability is raised by one or more items of information in the request, ex parte reexamination of the patent will be ordered under 35 U.S.C. 257. Upon the conclusion of the ex parte reexamination proceeding, an ex parte reexamination certificate, which will include a statement specifying that ex parte reexamination was ordered under 35 U.S.C. 257, will be published. The electronically issued supplemental examination certificate will remain as part of the public record of the patent. (c) If the supplemental examination certificate indicates that no substantial new question of patentability is raised by any of the items of information in the request, and ex parte reexamination is not ordered under 35 U.S.C. 257, the electronically issued supplemental examination certificate will be published in due course. The fee for reexamination ordered as a result of supplemental examination, as set forth in § 1.20(k)(2), will be refunded in accordance with 1.26(c). (4) Information material to patentability will be defined by § 1.56(b), notwithstanding § 1.555(b). Supplemental examination is concluded by the electronic publication of the certificate. The Office procedure after publication of the certificate depends on whether the Office determines that a SNQ affecting at least one claim of the patent is raised in the request. If the supplemental examination certificate indicates that a SNQ is raised, ex parte reexamination of the patent will be ordered under 35 U.S.C. 257. See 37 CFR 1.625(b). 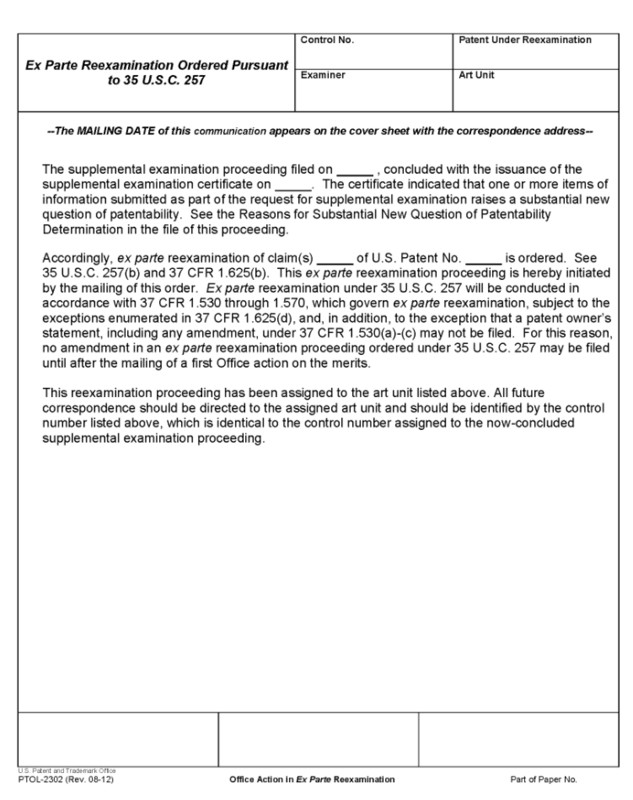 An ex parte reexamination ordered as a result of a supplemental examination proceeding will be conducted in accordance with the existing rules governing ex parte reexamination, except that: (i) the patent owner will not have the right to file a patent owner statement; and (ii) the Office will address each SNQ without regard to whether it is raised by a patent or printed publication. See 37 CFR 1.625(d) and MPEP § 2818.01 . If the supplemental examination certificate indicates that no SNQ is raised, ex parte reexamination will not be ordered under 35 U.S.C. 257. In this case, the electronically issued supplemental examination certificate will be published in due course by the Office’s patent publication process as an attachment to the patent. The fee for reexamination ordered as a result of supplemental examination, as set forth in 37 CFR 1.20(k)(2), will be refunded in accordance with 37 CFR 1.610(d). See MPEP § 2818.02. The material to patentability standard (37 CFR 1.56(b)) applicable to patent applications is also applicable to an ex parte reexamination proceeding under 35 U.S.C. 257 resulting from a supplemental examination proceeding because, like patent application examination, an ex parte reexamination proceeding ordered pursuant to 35 U.S.C. 257 is not limited to patents and printed publications. In contrast, the material to patentability standard under 37 CFR 1.555(b), which is applicable to ex parte reexaminations ordered pursuant to 35 U.S.C. 302, is limited to patents and printed publications. Any reference to "applicant" in 37 CFR 1.56(b) will be read as "patent owner" in the context of a supplemental examination proceeding and any resulting ex parte reexamination proceeding under 35 U.S.C. 257, because these proceedings are only available to a patent owner. If the supplemental examination certificate indicates that no SNQ is raised in the request, the electronically issued supplemental examination certificate will be published in due course by the Office’s patent publication process as an attachment to the patent. The fee for reexamination ordered as a result of supplemental examination, as set forth in 37 CFR 1.20(k)(2), will be refunded in accordance with 37 CFR 1.610(d).